The Dzongri- Goechala Trek in Sikkim is the most demanding trek for the rugged players that takes them towards Goecha La from Yuksom to Dzongri and brings the outstanding views of Kanchenjunga. From Yuksam, the trail follows the Rathong Valley to Bakhim and then brings a steep ascent to the village of Tsokha. Above Tshokha, the trail of Dzongri-Goechala takes you to Pethang and then with a further steps towards Dzongri (4020M). From this point, the trail drops steeply down the river to Thansing (3930M). The final destination of the Dzongri- Goechala Trek is at Samiti Lake from which the way to Goecha La brings the best views of Kanchenjunga. Dzongri, which is located at an altitude of about 4020 m in west Sikkim; brings the trekker a most fascinating close-up view of Kanchenjunga and Mt. Pandim. 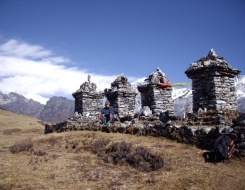 The west of Dzongri brings the long outline of the Kyangla ridge to make the region a trekker’s paradise. Goecha La, the region which is located at an elevation of around 4940 m, brings mind blowing sights of the mountains like Pandum, Kanchenjunga and more. Trekking round the Dzongri-Goechala ranges can also take the zealous trekkers around the Kanchenjunga National Park to volunteer different species of animals and mammals like Barking Deer, Musk Deer, Himalayan Black Bear Marbled Cat and the very rare and endangered Red Panda. In the morning after breakfast trek down to Tshoka. Overnight stay at Guest House. In the morning after breakfast drive to Bagdogra airport and from here catch a flight for onward destination. • Accommodation: Hotel in Gangtok & Yuksam on bed and breakfast basis. While on trek we will provide you Dome/Alpine trekking tents. Camping mattresses, kitchen tent, camping stool, camping table etc would be provided. • Transport: Tata Sumo/Mahindra Max car according to Itinerary. • Meals: At Hotels only breakfast will serve. While on trek, all meal. Meals will be freshly prepared and will be a mix of Indian, Chinese & Continental. • Yaks/Porters: For carrying camping equipment, rations, vegetables and some amount of personal gear of the clients (one bag not weighing more than 14 kgs).